To begin sharing your business, you and the person you are sharing with both need separate Online Sync accounts. If they only want to view your accounts, they do not need to purchase their own subscription. EasyBooks will sync more than the 60 transactions included for free, the limit is only imposed on adding new transactions or editing existing ones. Typically, your accountant will purchase either our Bronze or Gold plans so they can make changes. Why can't I just give out my password? You should never tell anyone else your Online Sync password, not even your accountant. Doing so violates our terms of service and also exposes your data to a third party, allowing them to pass it on to others or add other people's businesses into your account. When someone signs in as you, there is no restriction on what they can do with your account. They can delete your businesses, upload other member's data into your account, or lock you out of your account. When sharing feature is used, your account is more secure; your business and its backups cannot be deleted. You can even decide to share a read-only copy of your business, so you know nobody is making changes to your data. 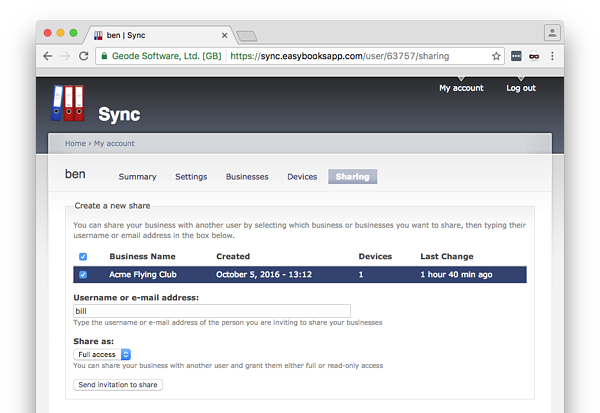 If you haven't already turned on syncing, see "Getting Started with Online Sync". Next, sign in at sync.easybooksapp.com. If you need help, refer to "My Account Page". Use the Sharing tab to start sharing a business. The same tab is used in the future to manage sharing, including revoking or changing access between "Read Only" and "Full Access". Type the email address of the person you want to share your business accounts with. If they don't have one, they can register for a two week trial account at sync.easybooksapp.com/user/register. Full access. Grant read and write access, and include features from your subscription (such as Unlimited Transactions and Foreign Currencies). You can share as full access with one other user, which may be useful if your accountant has not purchased their own subscription. Read & write. The other user can view and make changes, but will need to purchase their own subscription to EasyBooks. Read only. All information is visible, but it is not possible for the other user to make changes to your accounts. Finally, check the box next to the business you want to share and click Send invitation to share. You can use the Sharing tab to manage shared access to your business. For example, to stop sharing, find the Access dropdown and set it to "No access". Click Update to confirm the changes. An invitation is sent by email to the user you have invited to have access. To accept your invitation, the other user can follow the instructions in the email, and if you want to read these yourself, refer to "Accepting an Invitation".